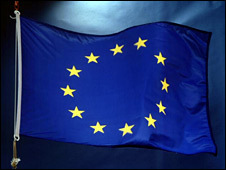 The UK has officially ratified the European Union's Lisbon Treaty. The documents were deposited with the Italian foreign affairs ministry in Rome on Wednesday. The move came despite doubts over its future after the "no" vote in the Irish referendum. All EU states must ratify the treaty for it to come into force. The EU treaty has proved controversial with unsuccessful attempts in Parliament and the courts to force a referendum to be held on it. Conservative MP Bill Cash sought a judicial review of the ratification process after the rejection from Ireland. And two High Court judges dismissed a claim by millionaire businessman Stuart Wheeler that there was a "legitimate expectation" of a public vote. Mr Cash branded the ratification a "gross impertinence", while Mr Wheeler described the ratification as "absolutely atrocious behaviour". On Friday he will seek permission from a Court of Appeal judge to appeal against that decision. He said he believed although the "instrument of ratification" has been deposited in Rome, the government still had the right to withdraw it and reverse its decision. Shadow Foreign Secretary William Hague said the prime minister had "no democratic or moral authority to sign Britain up to the renamed EU constitution". It was "a total breach of trust with the British people and a flagrant breach of his solemn election promise to the British people", Mr Hague added. He branded the government "arrogant and out of touch", and accused it of "joining in the ugly bullying of the Irish people, who have clearly rejected this treaty". But Commons leader Harriet Harman insisted it was "in Britain's interest to be at the heart of Europe and it's in Europe's interest that Britain should play a leading part". And Europe minister Jim Murphy said it was right to ratify the treaty "since both Houses of Parliament voted by substantial majorities in favour of it" and because it was "a good treaty" for Britain. "The Tories are playing games and engaging in political stunts as usual. The fact is that the Tories cannot be trusted to safeguard Britain's interests in Europe," he added. The "instruments of ratification" were signed by the Queen and Foreign Secretary David Miliband before being deposited in Rome. These documents are on chlorine-free paper, designed not to deteriorate over time. They were then sealed and bound in blue leather before being lodged in Rome. The treaty sets out a way forward for the 27-member and replaces the EU constitution which was abandoned after "no" votes in French and Dutch referendums. Opponents argue it is so similar to the constitution that promises to hold a referendum on the constitution should apply to the treaty. But ministers say the two differ and a referendum is not needed as the treaty does not have constitutional implications.